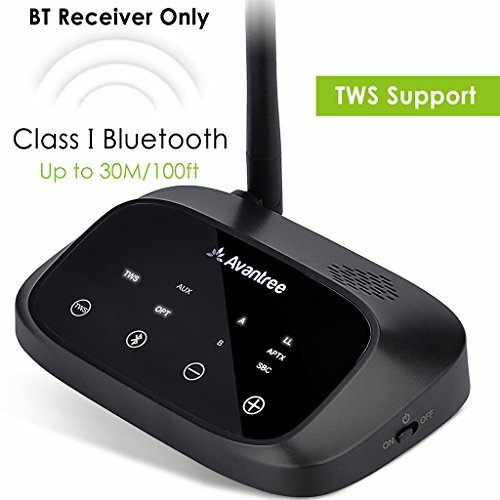 Avantree RC500 is a long range 100FT/30M Bluetooth receiver incorporating the latest "aptX low latency" technology, for CD-like quality sound with virtually no delay. Multifunctional support optical, voice prompt. Provide the best solution for your home audio systems to wireless stream hi-fi audio directly. We offer 36 Months Warranty for normal use. Live online support, Telephone Support, and email support are available. Video user guide are available also from Avantree site. BLUETOOTH RECEIVER: Turn a pair of normal speakers into wireless speakers using this long range Bluetooth receiver and stream your favorite music to your favorite speakers. Full voice menu prompts and easy to read LED status indicators make the RC500 simple to set up and use. Compatible with Echo & Echo Dot. LONG RANGE, AUX & OPTICAL SUPPORT: Bluetooth Class I technology together with a robust external antenna design means you can receive audio signals up to 100ft (30m) away. In addition the RC500 supports both analog (RCA/3.5mm aux audio) and digital (optical) output. Note: Wi-Fi routers, walls or other obstacles, wireless speakers, cordless phones and other wireless devices can affect Bluetooth reception. Please relocate your RC500 so it is not too close to such devices. NO LIP-SYNC DELAY: Experience your media at its best thanks to aptX Low Latency support - making the RC500 the ideal companion for watching movies and playing video games. Note: To avoid audio delay, make sure the transmitting device supports aptX low latency (visit www.aptx.com for a list of supported devices). Alternatively you can choose Avantree Oasis. TRUE WIRELESS STEREO: The RC500 supports True Wireless Stereo (TWS). Purchase two RC500 to stream audio to 2 separate sets of speakers - one set (of 2 speakers) will become R channel and one set (of 2 speakers) L channel. Perfect for large rooms or a studio where 1 set of speakers is not enough. NOTE: It doesn't support TWS and low latency simultaneously. 36-MONTH WARRANTY & ONGOING SUPPORT: Feel confident in your purchase with the 36-month warranty that's included with the Avantree RC500. You're also welcome to get in touch with our LA-based telephone support at 800 232 2078 if you have any questions about your purchase.